YULIN, Shaanxi - A 20-year-old man survived his 54-hour ordeal under a deadly landslide after rescuers pulled him out of the rubble in Shaanxi province on Friday. Rescuers said they found Cao Lele, his younger sister Cao Yanyan, 17, and the siblings' mother Yang Xiuping, 41, at 6:57 am on Friday after hearing the young man's cry for help under their collapsed home in Shuanghuyu village of Zizhou county. All three were alive when they were found but Yang died of serious injuries on her way to a local hospital while her daughter died in hospital despite emergency treatment, Zizhou local official Yuan Hongru said. "The girl had a very weak pulse when she was taken to the hospital. Emergency medical treatment failed after just a few minutes," said Wang Xiongwei, dean of the orthopedics department at Zizhou County Hospital. Twenty-seven people died from the landslide that hit Zizhou early Wednesday morning, said Zizhou deputy magistrate Wang Haiyang. Rescuers rush a victim to hospital. About 90,000 cubic meters of loess earth from a hillside crushed 25 houses and buried 44 people in the landslide, Xinhua News Agency reported. 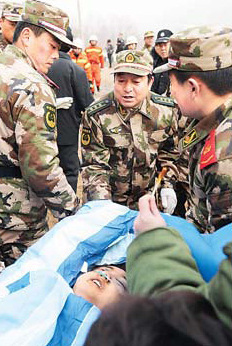 Among those buried, 27 died and the rest, including Cao Lele, were saved. "Cao Lele is still under emergency treatment and his condition is relatively stable, but he is still in danger," hospital director Han Xuefeng told China Daily on Friday afternoon. Cao was slightly injured and is still suffering from the effects of being buried for such a long time, doctors said. 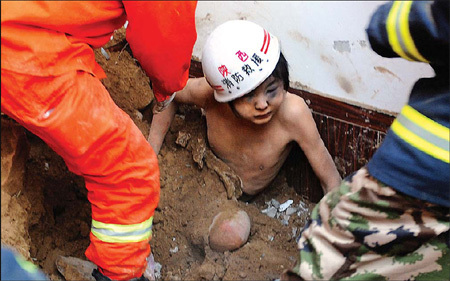 Cao Jingjun, the father of the survivor, said he initially felt a sense of relief when he saw his family being rescued from the debris. "But my girl later looked like she was dying," he said. Cao Jingjun said the family bought their house with 60,000 yuan ($8,785) in 2009 and he escaped from the disaster because he was working in a mine in the neighboring county of Fugu. Cao Lele's uncle said he telephoned his nephew's house after hearing about the disaster and found the phone working. "I thought there were some rooms left intact under the thick earth. I was hoping to see them alive," he said. On Thursday, three of 10 landslide victims who were slightly injured had been discharged from hospital. The landslide victims were not locals of Shuanghuyu village, Wang Haiyang said. They bought the houses there because the village is only 1 km from the county seat, he said. The county's civil affairs bureau has issued compensation payments, grants and basic supplies to survivors and their families, officials said.